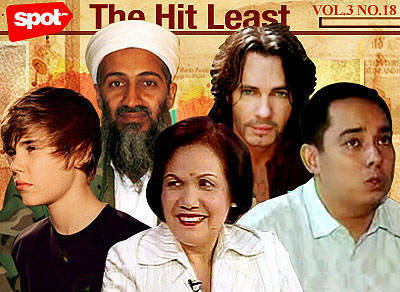 Plus, Bieber’s egg trauma, Osama bin Laden dies + more lowlights. 1. MERCEDITAS GUTIERREZ RESIGNS AS OMBUDSMAN. What took you so long? 2. GIBO TEODORO SAYS HE’S NOT INTERESTED IN REPLACING MERCI AS OMBUDSMAN. 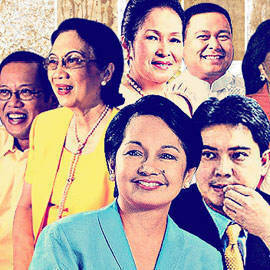 Because he’d rather replace Noynoy? 3. SENATOR CHIZ ESCUDERO WEIGHS IN ON THE OMBUDSMAN’S POSSIBLE REPLACEMENT. Hint to PNoy: "Pick me!" 4. SENATOR PING LACSON DENIES SENDING EMISSARIES TO THE DEPARTMENT OF JUSTICE. Cue Village People’s "Macho Man." 5. MAGGI NOODLES (BEEF FLAVOR) TEST POSITIVE FOR SALMONELLA. 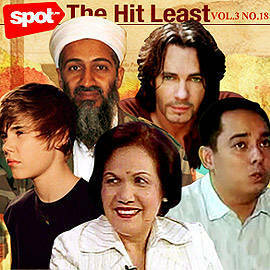 Will Tita Maggi take the blame for this? 6. OSAMA BIN LADEN IS KILLED IN PAKISTAN. Really? 8. P-NOY PUSHES FOR WAGE HIKE. New slogan: The Filipino is worth losing your hair for. <>9. JUSTIN BIEBER HAS SIX EGGS THROWN AT HIM DURING HIS CONCERT IN SYDNEY, AUSTRALIA. Why would you pay for a concert only to throw eggs at the performer? <>10. SINGER RICK SPRINGFIELD, AN 80S ICON, WAS ARRESTED FOR DRIVING DRUNK. What else can we say but, "Cute mugshot."